57/123 David Mumpower Too silly at times, I think this shows a lot of promise as a franchise although the book is probably better. 72/190 Max Braden I have trouble analyzing whether or not I would have thought this was cool when I was 15. At this age, it's just kind of there. Aspiring screenwriters, Hollywood has a message for you. The way to get a feature film greenlit is not to write a unique and engaging script; rather, it is simply to write an eight-book children’s fantasy series and await gigantic, star-laden offers. Despite disappointing returns for such kiddie fantasy flicks as Eragon and The Golden Compass, studios seem to be under the impression that any story that can get children to turn 1,000 pages is inevitably going to be a blockbuster. Percy Jackson and The Lightning Thief, based on the first book in the Percy Jackson and the Olympians series, sees the young lad who has absolutely no resemblence or similarity to Harry Potter, no sirree bob, discover that he is in fact the son of the Greek God Poseidon. Yada yada yada, swords and magic, battles with the gods. Maybe it’ll trick a few ten-year-olds into reading the Iliad. Chris Columbus, the reigning king of sentimental pap, is on hand to direct. Can a kid’s movie about Greek gods be made even more overwrought? Anyone who’s ever seen a Chris Columbus movie says “Yes.” This is Columbus’ first directing effort since 2005’s adaptation of the musical Rent; Columbus is certainly familiar enough with the genre, having helmed two Harry Potter flicks. Furthermore, his moneymaking track record with the younger set is long – aside from Harry, there’s that whole Home Alone thing. Joe Stillman, who penned the first two Shrek films, is co-writing the script with the book series’ scribe, Rick Riordan. 20th Century Fox is the one taking this gamble – I’m going to go ahead and assume that this was given the go-ahead before Prince Caspian sailed by without anyone noticing. 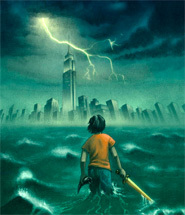 See the latest developments for this project on the Percy Jackson & The Olympians: The Lightning Thief Movie News page.